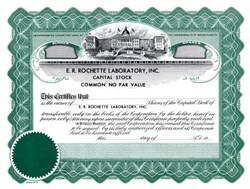 Beautifully printed unissued stock certificate from E.R. Rochette Laboratory, Inc.. This historic document was printed by the Goes M 113 and has an ornate border around it with a vignette of the Massachusetts State House.